BBC NEWS | Americas | Did Brown succeed in Washington? Did Brown succeed in Washington? Pity the modern politician like Gordon Brown, for whom even the longest foreign trip to the most distant of places offers no respite from the cares of the day at home. Even as the Prime Minister grapples with the catastrophic economic fallout of globalisation, he has been suffering at the hands of the media's own version of it. Stories of his domestic political difficulties preceded his arrival in America like heralds announcing the arrival of an ancient king. If you have low poll ratings in the modern world - or you are under pressure to apologise because you were at the helm when the seeds of recession were sown - then your hosts know all about it before your plane lands. And judgements on how your trip is going travel back with the same bewildering speed. We were discussing whether or not Mr Brown had been "snubbed" by the White House before he had reached the sanctuary of the British Embassy on the night he arrived - and that debate probably helped to shape British perceptions of the trip before it was properly under way. So Mr Brown's mission - unkindly summarised as an attempt to bolster his own fortunes by somehow associating himself with Mr Obama's superstar glamour - was under pressure from the very start. And underlying it all, of course, was a peculiarly British combination of touchiness and paranoia about the continuing "specialness" of the Special Relationship. Britain's place in the world these days, like it or not, depends in large measure on the perception that it is America's closest and most dependable ally. The British press therefore is sensitive to any suggestion that things might be changing. The absence of a formal news conference or a star-studded dinner, and the decision to move the press availability indoors from the Rose Garden, went down particularly badly. But we will not know whether or not it is a snub until Mr Obama has received Angela Merkel and Nicholas Sarkozy as well - if he wheels out the white tie and tails, the dancing girls and the good china when they are in town, then perhaps Britain would have something to feel uncomfortable about. But, for the moment, it seems reasonable to conclude that the Obama administration - struggling with a deep recession at home - might be planning to strike a rather austere tone in its dealings with visiting foreigners in general. The appetite of hard-pressed American voters for seeing their leaders putting on the Ritz at the moment is probably rather limited. So when an American official spoke of a "special partnership" rather than the "special relationship" that the British like to talk about, it triggered one of those spasms in British political journalism that border on the metaphysical. Was that a signal of some sort? A code that America was downgrading the transatlantic link? Americans were genuinely puzzled that the issue had even been raised - who says, after all ,that a partnership is a lesser thing than a relationship? And did it not make sense, one American journalist asked me in amazement, to move the meeting with the press indoors when it was twelve degrees below zero outside? Mr Obama gamely did his best to kill off the story about snubs by talking warmly of the special relationship, predicting that it would endure and reminiscing about how his mother's side of his family originally hailed from England. 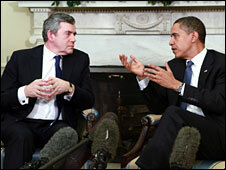 In a way, the Special Relationship was at its zenith during the Second World War, when the moment of mutual need was greatest and when Britain was led by Winston Churchill, who was after all, half-American; nothing that Gordon Brown could say about the need to combat recession together could possibly compete with the intensity of the 1940s. He did his best with talk of a Global New Deal and some sort of international agreement on a new system of banking regulation, but that sort of talk is met with caution for a variety of reasons. Mr Obama, for example, did not take up the talk of a Global New Deal because he probably senses that American voters would be suspicious of expensive foreign entanglements when they are worried about the economic prospects of the USA itself. And domestically, there is still an appetite to hear Mr Brown talking about the past as well as the future; was there nothing he could have done in all those years as Chancellor of the Exchequer to tighten banking regulations to stop all of this from unravelling? Still, there were positives for Mr Brown in all this. His speech to the joint Houses of Congress was a solid and interesting one, with a rather American feel to it - lessons learned from his father the minister, and lavish praise for the unbridled possibility of the United States - an "irrepressible nation", as well as an "indispensable" one we were told. It went down pretty well - although the repeated standing ovations have to be seen in context. The joint houses are almost as well-drilled as the National Assembly of North Korea in recognising the key moments in a speech which call for you to leap to your feet applauding. 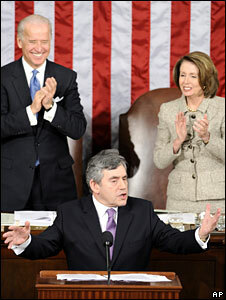 In American eyes, Gordon Brown is no Tony Blair or Margaret Thatcher and there is frankly not much he can do about that. He made a decent impact here, and raised his profile without commanding huge attention. But we should not read too much into the relative modesty of American coverage of the trip. That was always going to be the way of it. America still likes Britain - but it likes Israel, Mexico, Japan, China and Canada too, among others. The bottom line for Britain is that lots of foreign leaders come here and any absence of column inches reflects more on Britain's standing than Gordon Brown's.